The separators enable accurate picking of components with automatic tools, like AGV and robot systems, as well as increase the number of components in a containers up to 30%. Everything's ready for the market commercialization of the "3D Locator Creation Software Module" an ongoing part of the OEDIPUS High Impact Initiative focused on automating the creation of 3D Locators and increase their packing efficiency. The product launch will be officially announced by DeskArtes, one of the initiative's partners, at the Formnext 2018 trade fair on manufacturing technologies, which will take place in on November 13-16 in Frankfurt, Germany. The 3D Locator Creation Module creates 3D Locator designs directly from the digital model of a component. 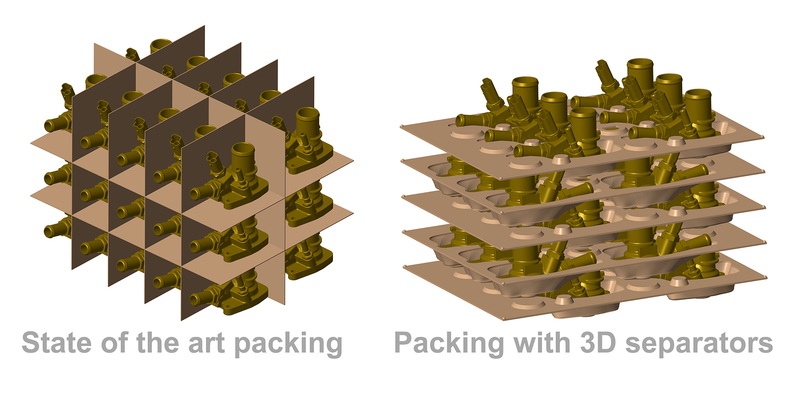 This makes sure that the packing efficiency of the 3D Locator is the best it can be and also speeds up the whole process: the development of separator plates drops from weeks to just hours, thus giving a very quick ROI for companies interested in sustainable manufacturing. The automotive industry, in particular, could benefit from the introduction of such a tool. "Within the current EIT Digital initiative DeskArtes has developed a new software tool to better organize components when transporting them from the supplier to the car manufacturer. Our 3D Locator software tool provides functions to position and overlap components effectively in a container using specially designed separators between the component layers," DeskArtes' managing director, Ismo Mäkelä says. The separators enable accurate picking of components with automatic tools, like AGV and robot systems, as well as increase the number of components in a containers up to 30%. This will lead to increased efficiency within the car assembly line and save natural resources when transferring components from supplier locations all around the world to the assembly plant. DeskArtes has been working on the 3D Locator module together with other OEDIPUS partners: Aalto University, CRF and CEA. The final result of their combined efforts will be presented at Formnext 2018, booth 3.0 J91.